Expert committees of educators, booksellers, school and public librarians from across Canada have handpicked the materials listed below. Committees look for excellence in writing, illustration or performance. Most importantly, these committees focus on selecting materials that will appeal to children and young adults. Click here to purchase new or past issues! 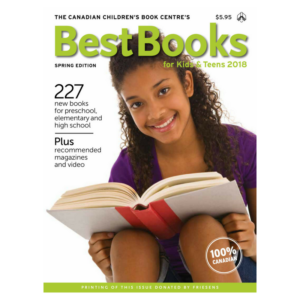 The Canadian Children’s Book Centre (CCBC) is now accepting submissions for the fall 2019 edition of Best Books for Kids & Teens (BBKT). For the fall 2019 edition, our committees will only be evaluating books/resources published between January 1, 2019 and June 30, 2019. The deadline for submission is May 1, 2019. For more details, click here. Download Media Kit for advertising rates. Download Ad Insertion Order Form.